Serene and Jon from Toronto who met at work and discovered a mutual love for travel, adrenaline, and good food. They love planning every detail of their vacations together and creating vacation videos, so when they planned a romantic getaway to Bora Bora, Jon proposed to Serene on their first night and captured the whole thing on video! Jon: French Polynesia was always on our bucket list, but I decided to push this forward after realizing I wanted to propose to Serene in a unique location that not many people experience. 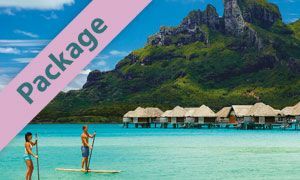 Bora Bora is a dream destination everyone sees in travel ads: overwater villas, wildlife, and crystal clear waters. My main goal for the trip was to execute the proposal perfectly. Of course, I had to keep this a secret and surprise Serene on the day. It was incredibly hard to keep the entire plan hidden for nearly a year! 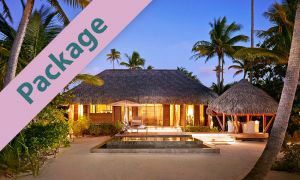 Since Bora Bora is a dream vacation, so we decided to splurge and go with the St. Regis Bora Bora. The resort is incredible and extremely well kept. Staff are unbelievably efficient and hospitable. Serene: Bora Bora was so beautiful. The moment we stepped foot on the dock, the St. Regis staff greeted us graciously. The grounds of St. Regis are incredibly well-maintained and breathtaking. We especially loved the abundance in vegetation (tiaré flowers, coconut trees, and pineapple trees), the crystal blue waters, and most importantly, the lagoonarium, which had all of the most beautiful and lively fish. 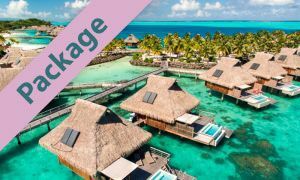 We stayed in an overwater villa and were so pleased with the size, the facilities, décor, the speakers that ran through the bungalow allowing us to hear our music throughout, the excellent sound insulation, as well as just the overall condition of the bungalow. It was truly “home” for the week. We stayed in bungalow 328, which was a 2-3 minute bike ride back to the main dock with a view of the beach on the right, and the other bungalows on the left. 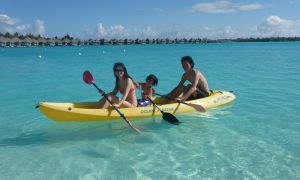 Each day we could see the other couples paddle boarding, canoeing, or jet-skiing in the distance. Jon: We wanted to experience as much as we could during the trip. 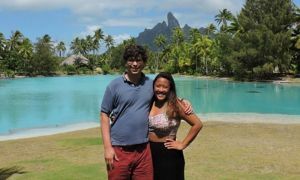 Traveling to French Polynesia from Toronto takes approximately 15+ hours and we knew it would be a trip of a lifetime. 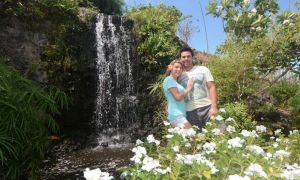 As a couple, we planned to do everything the island had to offer. This included jet skiing, snorkeling, and seeing how the locals live, a helicopter tour, and just relaxing. 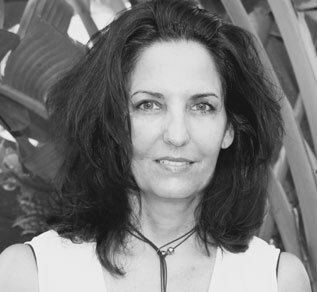 Serene: We like to relax but love adrenaline. 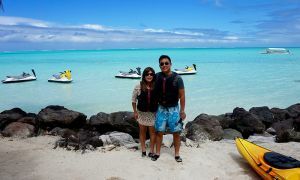 We booked many activities in advance, and even booked an additional activity when we were on Bora Bora. The week passed by so quickly because we just had so much to do: Shark and Ray tour with Ra’anui (which came with our Pacific For Less package), Jet-skiing with Matira Jet Ski tours, a 30-minute helicopter ride where we got to see Tupai, feeding, caring, and swimming with the most adorable green sea turtles at the Bora Bora Turtle Center at the next door Le Meridien, the Miri Miri Spa (we had a couples massage included with our package), swimming at the beach, snorkeling in the resort lagoonarium, and biking around the resort. Our only daily routine consisted of waking up bright and early to have our breakfast buffet and then setting out to do our activities. Service was excellent! One day when we went to Vaitape, Jon accidentally left our camera on the shuttle bus (but didn’t remember), until we were preparing for bed and wanted to look at photos we took. After a lot of grief, we narrowed it down to two places where it could have been and called the concierge immediately. Vaite (the concierge) immediately called the bus driver from the shuttle bus. After about 10 very nerve-wracking minutes, she called us back and told us that the bus driver had actually called all the resorts that he shuttled that day to see if anyone had lost a camera!!! Jon: Another very notable staff member was Masahiro Iemoto. He took all of our proposal pictures for us and was just a very pleasant and happy staff member. Serene: Food at the resort was very good. Jon and I looked forward to breakfast daily. We also ate at Lagoon by Jean Georges, Far Niente (Italian restaurant), and the Sushi Take (Japanese restaurant). For an island so far away from any other country, the food was simply delicious. I especially remember the fish and scallop sashimi from Lagoon restaurant, and the steak from the Italian restaurant. Everything tasted fresh and clean. Jon: Food at the resorts can get quite expensive so there are quite a lot of alternatives in Vaitape, the main town in Bora Bora. There were a few dining options and we frequented Aloe Café a few times. There are also the two supermarkets Chin Lee and Super U which offer very reasonable prices and a large selection. Serene: We ate at their local restaurant and food carts, visited the craft market, visited Matira Beach, and even shopped for groceries like the locals! 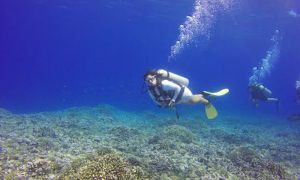 We were able to see life in the island and interacted with some local people. We enjoyed our conversations and realized just how happy and simple their lives are. 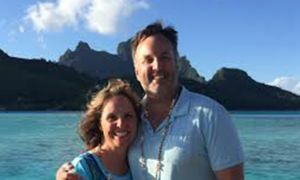 Jon: When it comes to travel planning, we like to plan everything well in advance, down to hourly activities. Structure is very important to us but we’re quite flexible as long as most of our targets are met. 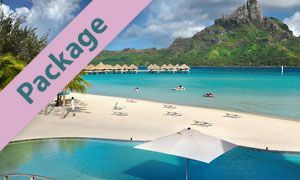 We usually don’t work with a travel planner because we enjoy researching every part of the trip, but when we started researching Bora Bora we found it to be extremely expensive until discovering Pacific For Less. The price was considerably lower than any other agency or travel portal. The enabled us to finalize our choice to make the trek to Bora Bora. Pacific for Less was extremely easy to work with. They’re really fast at communicating and don’t miss a beat when getting the details right. They definitely made our trip planning easier. Perks like the shark & ray tour, the included dinner, and welcome gifts at the airport and resort were real bonuses. Serene: Thinking back to the trip, everything was unforgettable. 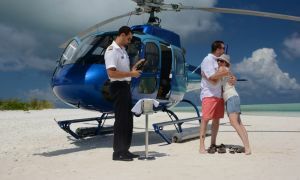 From the people, our overwater villa, the food, the activities, our engagement, and all the memories we have made, there is nothing we didn’t love. We even became really good friends with another couple, with whom we have kept in touch with. Even though there was a torrential storm and it rained on and off heavily for two days, we loved our trip. 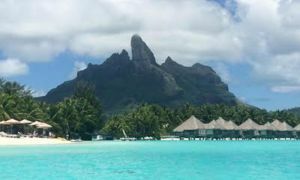 Serene: We flew business class, and it was definitely worth it because we got 8 hours of undisturbed sleep, which allowed us to enjoy the first day in Bora Bora. Had we sat in economy, we would have spent our first day at the resort sleeping and missing the beautiful sunset that Jon proposed to me in front of. Jon: Next time we would do a combination of islands, such as Moorea and Bora Bora. 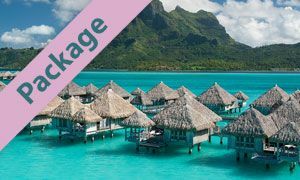 Although we didn’t do this, I’ve heard that Moorea is a cheaper alternative and has excellent land-based activities in addition to spectacular snorkeling, whereas Bora Bora has unmatched waters, luxury, and relaxation.